These are the devices used on large commercial and industrial buildings to give up all of the heat absorbed by a buildings air conditioning system up to the atmosphere. Its analog in a residential split system would be the condenser unit. Air conditioning is really the process of heat transfer. To cool a space most air-conditioning systems transfer the heat out of it and not put the cold into it as one would believe. Most large buildings use big air handlers to do this. Chilled water is pumped through the coils and the air from the space to be cooled is blown across the coils. As this happens the heat from the air gets transferred into the chilled water, which gets circulated through the heat exchanger of a chiller vessel. This causes the refrigerant gas to boil off and vaporize as it absorbs the heat from the chilled water. 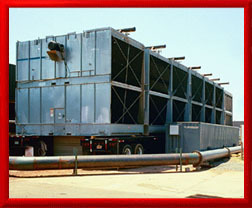 The compressor recompresses the gas and it is further cooled (condensed) by the water circulated from a cooling tower. The cooling tower water absorbs the heat from the refrigerant gas in the chiller's condenser section and then it gets pumped up to the cooling tower where through the process of evaporation the heat is given up to the atmosphere.